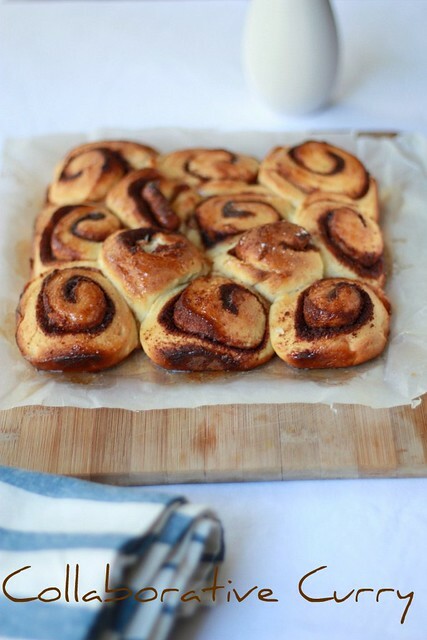 Whirl wind romance with cinnamon rolls. Pretty, sweet swirls with cinnamony goodness a delight in your mouth and to the eyes. The aroma wafting while it bakes puts all candles from the store to shame. I have to confess though that kneading the gooey dough for a good 30 minutes was no joke. To begin with I measured the quantity of dough all wrong. I use a light flour 'White Lily.' If you are not using bread flour and this one they remember to read the fine print. It says, add 1 cup and 2 tbspn to equal 1 cup of all purpose flour. Bah! not being careful with the measurement made me waste a lot of time. It took my brains 30 of kneading the gooey dough before realizing the folly. The very wet dough I was working with proved too much for my shoulders. However, once I got the proportions all fixed it worked like a charm. Like in all relationships misunderstanding once worked out everything falls in place. The cinnamon rolls out of the oven was perfect. I was tearing at it in delight as soon as it was cool. They are great as an evening snack with tea or breakfast with a strong cup of Nescafe. 1. Once the dough has doubled (it takes about 1 1/2 to 2 hours) punch down the dough and roll it out into a rectangle shape. Entering this for Champa's Bake off Event. To find more click here. 30 mins?? Must be tired by the end of it... but the end result is superb!!! I love cinamon rolls and this looks so so good. Cinnamon Rolls look very nice. Thanks for the lovely entry. My husband loves this.have bookmarked it. I can smell the nice aroma of cinnamon rolls..looks so yuummy dear. Drooling rite now here, thats a cute looking rolls..
Yum, they look beyond amazing! 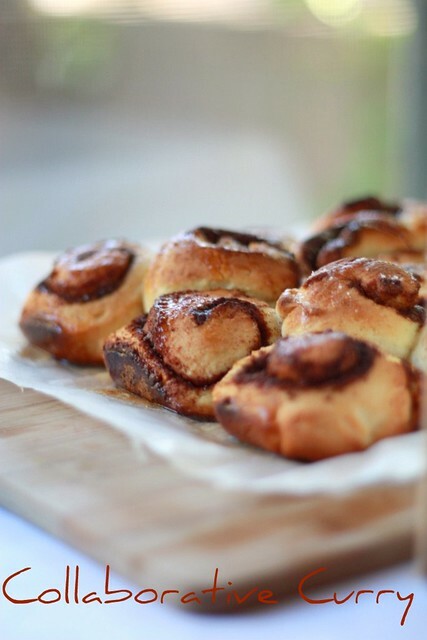 Your cinnamon rolls look just perfect to enjoy with some good breakfast tea! Wow, they look so cute.. I just want a cuppa coffee! Looks great !! Awesome pics too.I will try this out soon !! OMG! 30 minutes of kneading!!! The rolls look beautiful and tempting! Drool. I completely agree to these lines 'aroma wafting while it bakes puts all candles from the store to shame'. Aroma of Cinnamon is truly mesmerizing. wow..I love cinnamon rolls, and that one looks absolutely delicious! I am bookmarking this one!! Ah, good ol' bread making... these remind me of my mom's cinnamon rolls... they look delicious! You are tempting me with these cinnamon buns. It will be so good with a cup of tea. They look good, should taste good... but not worth a try for me as I do not have Baking equipments :( I am planning to buy an oven the next year, January and then I will start with the baked recipes. My Mother will like it. Will send the recipe to her. Wow these I can almost smell them virtually.They look delectable. Liked the opening lines. And the cinnamon Rolls...wish could get them now. Cinnamon rolls looks awesome, feel like having some..
How cute! They are so crispy and exquisite! Slurp! Good for tea time! ahhh aweosme dear. I am dying to bake these but not getting good yeast to start with. perfect. wow...it really looks delicious...love to try it soon itz just 30 mins alround...intersting sunitha..
super duper ! loves these rolls. 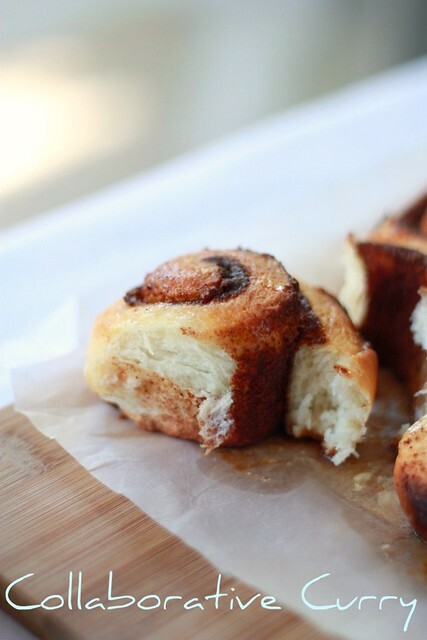 Love the smell of cinnamon...these rolls look lovely! too good.. i love cinnamon flavour.. this has been on my list for so long! thanks 4 sharing! Such yummy looking cinnamon rolls! wow!! awesome..beautiful clicks..and looks adipoli!! Cinnamon rolls look lovely!! Fantatic pictures..